The Kansas Jayhawks and the Michigan State Spartans face off on Sunday outside of Orlando in college basketball tournament action. The Kansas Jayhawks have won three games in a row since taking their only loss of the season getting trounced by Kentucky. KU is raked 12th in the nation and once again Bill Self has a roster loaded with NBA caliber talent. Kansas is averaging 70.8 points per game and they are shooting 43 percent from the floor while defensively they are allowing 63.6 points and their opponents shoot41.1 percent. Perry Ellis leads the Jayhawks averaging 15 points and 6.6 rebounds. 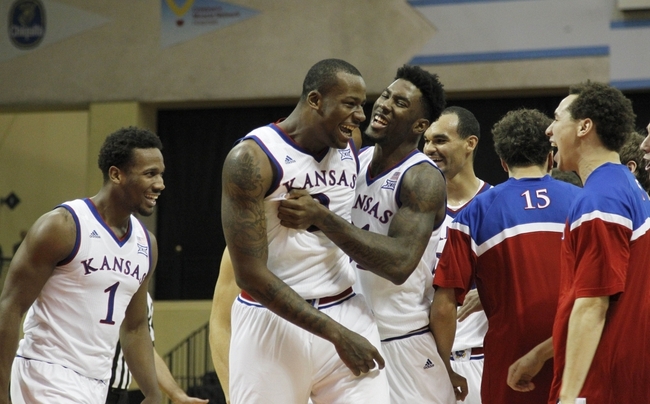 Cliff Alexander is averaging 10.4 points and 5.6 rebounds, Frank Mason is averaging 9.8 points, and Wayne Selden is averaging 8.2 points and 4.0 assists. Kansas is a lock to make the NCAA Tournament but they will need to play better than they did in their last crack at top tier competition to win this one. The Michigan State Spartans have won four games in a row since taking their 10-point loss to Duke. MSU is coming off of an 11-point win over Marquette where they shot almost 58 percent from the floor. Michigan State is averaging 76.2 points and they are shooting 51.5 percent from the floor while defensively they are allowing 59.5 points and their opponents are shooting 37.5 percent. Travis Trice leads the Spartans averaging 16.8 points, 4.7 rebounds, and 6.5 assists. Denzel Valentine is averaging 14.5 points, 5.3 rebounds, and 4.3 assists, Branden Dawson is averaging 10.6 points and 7.6 rebounds, and Bryn Forbes is averaging 9.3 points. Michigan State lost on the same night as Kansas in Indianapolis. Kansas is 5-11 against the spread in their last 16 non-conference games, 2-5 against the spread following a game that they covered the point spread, and 4-13 against the spread against the Big Ten. Michigan State is 9-3-1 against the spread against the Big 12, 3-7-1 against the spread in their last 13 non-conference games, and 1-5-1 against the spread in their last seven neutral site games. Michigan State has covered the point spread in their last five games against Kansas. With the line a virtual pick I just like the athletes on Kansas and I see the Jayhawks getting the win here.